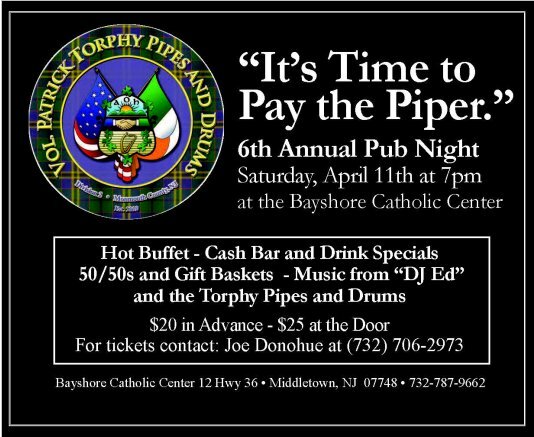 April finds the pipe band gearing up for our 6th annual “Time to Pay the Piper” pub night fundraiser this weekend. This is the band’s biggest fundraiser of the season and proceeds go towards purchasing uniforms and equipment for the Torphy Pipes and Drums. The date is Saturday, April 11th at the Bayshore Catholic Center from 7pm to 11pm. A $20 donation gets you a hot buffet, drink specials like $5 pitchers of Miller Lite, $15 pitchers of Guinness, $3 glasses of Sangria and $2 glasses of wine. There will be 50/50s, gift baskets and a raffle for $100 worth of NJ Lottery scratch off tickets. Plus we’ll have music from the Torphy Pipes and Drums, DJ ED, plus a very special visit from the Daly School of Irish Dance! See a band member for tickets or visit www.TorphyPipeBand.com for more information.